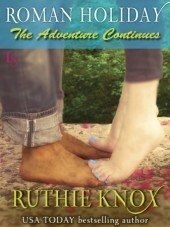 Roman Holiday by Ruthie Knox isn't a series it's a whole contemporary romance book that was published in 6 parts (each about 40-60 pages). Originally planned to be published in 10 parts. First 5 parts were published weekly then there was a break of a few short months and following that 5 more parts were suppose to be published but for some reason they were all published together as parts 6-10. Now, you can either buy Part 1 (chapters 1-5) and Part 2 (chapters 6-10) separately or you can buy the whole book combined. I think it's a nice idea publishing a book in parts, kinda like a TV series. Yet again I'm not a very patient person so I rather have all of it at once to read at my own leisure. Now that it's all published you can still decide or reading it in parts, meaning, each part tells a short piece of the story it's not like reading a book and deciding to stop on a specific chapter (in the middle of all the mess/action/emotion). For those of us who find it hard to commit to long periods of reading - the way this one is built is just perfect! The book tells the story of Ashley and Roman. Roman is a constructor who bought Ashley's grandmother's resort planning to demolish it and built a big fancy hotel. Ashley, who can't see the only place she called home destroyed "tricks" Roman into a "vocation" in which she takes him with her trailer to visit friends who came frequently to her grandmother's resort. What each one learns is quite unexpected. But as it seems both of them have much to learn about themselves and the way they chose to live their lives. Naturally there's also a romance here :) Roman and Ashley might be different - darkness to light kind of different, yet, they are perfect for each other exactly for this reason and for the fact that what they see in each other no one else ever did, not even themselves. As all books by Ruthie are - RECOMMENDED!